Dear friends – thank you for taking the time to respond to my survey on a Nigerian food & drink magazine. I promised to share some results of the 10-minute survey I conducted in early October on a Nigerian/African food & drink magazine. In Brief: 73 people from all over the world responded to this survey, majority of who are aged between 35 – 44 years. About half of the respondents are home-cooks (like me) and are of Caucasian and Nigerian heritage. Roughly half of the responding population is female. A total of 73 people took the survey. When I began I had NO idea, absolutely no idea of how many people would respond. I am really pleased that so many people took time out to respond, but also to forward it on to family and friends. Thank you! Food & culture researchers, Geologists, Students, Content Editors, Homemakers, Insurance Underwriters, Nutritionists, Hospital workers, Landscape designers, Mortgage bankers, Writers, Bankers, Teachers, Lab Scientists, Photographers, Editors, Anthropologists, Financial market traders, missionaries, Lawyers and more took the survey. Almost 80% of you don’t live alone: 40% of people live with a partner, 23% with family members and 16% live with young children (this is the same for me – I live with a husband, my sister and 3 children!). When did people respond? And do you know why? 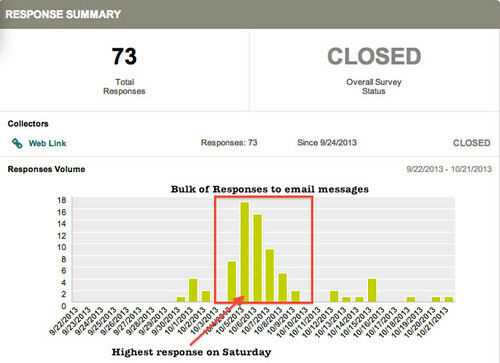 Most of the responses occurred over a weekend (see image above), with the greatest number of entries received on a Saturday. I sent out multiple emails over that weekend and it is great to see a direct correlation between the emails and responses. Geographically: You come from ALL over the world – from Australia to Japan. Croatia to New York, London, Scotland, France and Amsterdam. 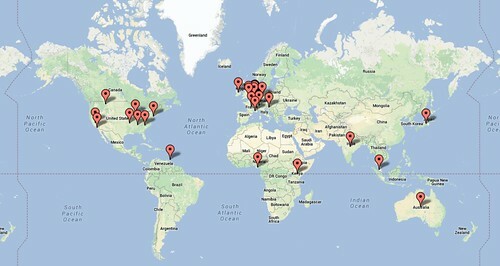 I’m amazed to see how much of a geographical spread there was in the survey. I’ll love to use this information to target distribution plans for the magazine. Yes. More females than males took the survey! What do you want in a magazine? Over half of the group prefers to read magazines in standard print. Half of the responses came from home-cooks like myself, with 13% of repondents being food bloggers & writers. 27% aren’t cooks but love food – don’t worry, we have great content planned that will keep you happy too. Recipes, Travel and Street Food came up clearly as what people want. I got a lot of GREAT feedback on things and areas I hadn’t considered but could easily incorporate. I am really thankful beacause this helps me understand what people want and need in a magazine. I look forward to bringing you this magazine in the coming year. I am looking for a great Art director (who will be paid :-)) and can translate the concepts into visual delight. Shout if you know anyone! I would also love to have a mentor who can help me navigate the big world of magazine publishing. So if you know anyone who would like to take me on, please let me know! Regardless of my needs and wants, I’m forging on and look forward to holding the first edition in no later than 9 months from now!